This little turtle is about to be released into a protected pond site. Photo by Ryan Hawk/Woodland Park Zoo. From the parking lot you pull into off a suburban drag, you’d never guess you are about to enter a protected wetlands, where hope for an endangered turtle species hangs in the balance. Pull on your rubber boots, head through the reeds down a thin, winding path flattened by the steps of the biologists ahead of you, and as your feet start to sink into the softening ground, you know you are getting close to your destination—the edge of a small pond with a big story. 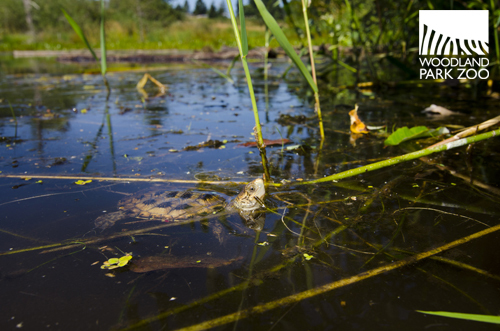 It’s unassuming, but this spot—marked by nothing more than a temporary wooden plank for our safe balancing—is where hundreds of turtles have made the journey back into the wild over the past 20 years through an ambitious conservation effort to bring the native western pond turtle back from the brink of extinction in Washington state. 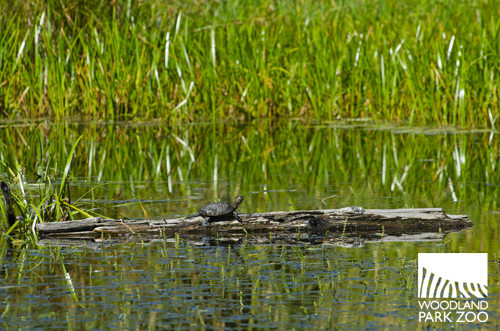 The western pond turtle population has been decimated here in recent decades. Invasive species like the bullfrog prey on pond turtle hatchlings or compete with them for food (and win). Human development has encroached on wetlands, taking away key turtle nesting sites essential for breeding. 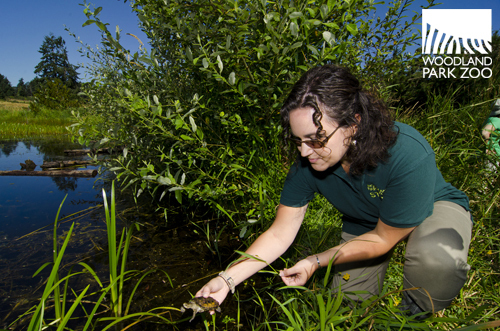 To help these turtles make a comeback, we collaborate with Washington Department of Fish and Wildlife and Oregon Zoo to restore habitat and give hatchling turtles a head start on life in the wild. Turtle hatchling that was raised at Woodland Park Zoo through the head start program. Photo by Ryan Hawk/Woodland Park Zoo. Here’s how head starting works: we collect eggs and sometimes young hatchlings from protected sites in the wild, rear the baby turtles at the zoo until they are large enough to avoid the mouths of predators, and then return them to the protected sites where we track and study their progress as they rebuild their population. We’re here today to release more than 90 juvenile turtles that have spent nearly the first year of their lives at Woodland Park Zoo. Sitting in rubber bins surrounded by zoo staff and biologists, the turtles have no clue how much their lives are about to change. At the pond edge, sending the tiny turtle off into the water. Photo by Ryan Hawk/Woodland Park Zoo. A Fish and Wildlife biologist hands me a squirming turtle with a tiny number 2 glued to its shell, to help us identify it as we track its progress. I hold "2" gingerly between my fingers as it cuts its webbed feet through the air as if it’s already swimming. Hold onto that instinct, little one, because it’s about to come in handy. I kneel down and stretch my arm out to the pond’s edge. I’m moving slowly, but when I finally place the turtle on the surface of the water, it takes off with such speed, I realize I am only prolonging the moment for myself and the little turtle is ready to move on to its new life. Off on its own now. Photo by Ryan Hawk/Woodland Park Zoo. This wetlands site will be a nice home for "2" and its fellow turtles, one of two sites that have been established in the South Puget Sound watershed through the Western Pond Turtle Recovery Project (four more such sites have been established along the Columbia River Gorge). Here "2" will find logs for basking in the sun and protected nesting sites to allow the released turtles to breed and build the population on their own. And that’s really the ultimate goal—to create self-sustaining populations of these turtles, which we have built from just 150 individuals in Washington in 1990 to 1,500 today. 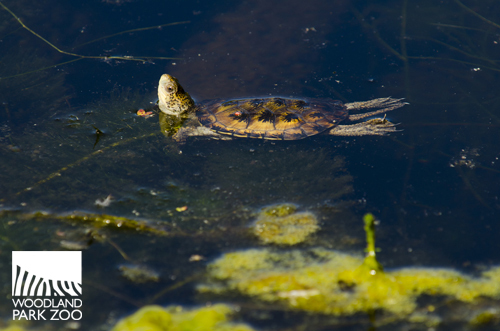 An older pond turtle basks in the sun. Photo by Ryan Hawk/Woodland Park Zoo. Last year, we celebrated 20 years of the Western Pond Turtle Recovery Project (with turtle-themed cupcakes that dyed our mouths green). Now it’s time to look ahead to the next 20 years. Will we always be head starting and releasing turtles, or will there come a time when enough habitat is restored and invasive species removed, that the turtles can populate and survive on their own? A released turtle swims with style. Photo by Ryan Hawk/Woodland Park Zoo. The importance of this question goes beyond the story of this one turtle species—one of only two native Washington turtles. It’s the story of living landscapes—habitats that were once wildlife refuges but now precariously balance the needs of wildlife alongside the needs of humans. 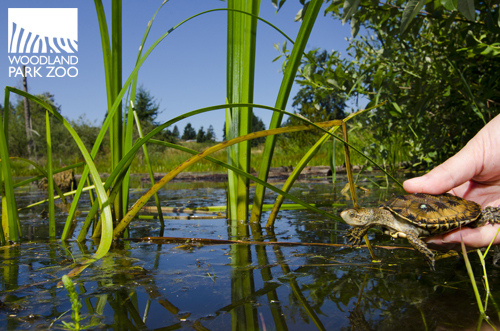 Over the last two decades, the turtle recovery project has catalyzed the purchase and management of 425 acres of wildlife habitat with pristine wetlands near the Columbia River Gorge. 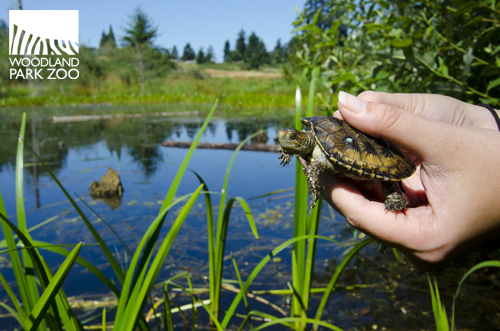 The humble western pond turtle serves as a focal endangered species for ensuring the habitat stewardship of an additional 300 acres in the Gorge area and Puget Sound lowlands. 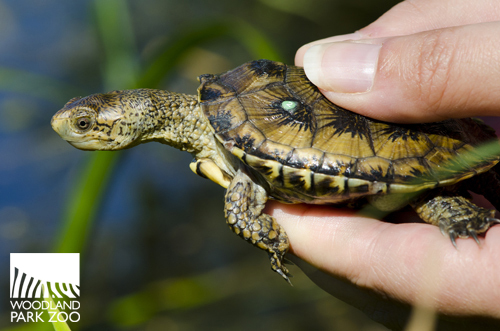 In this, the tiny western pond turtle has become an umbrella species. The turtle’s native grassland and oak savanna wetlands are two of the rarest habitats in Washington, and our efforts to save the turtle in turn save countless plants and animals living in these habitats across the state. 1. 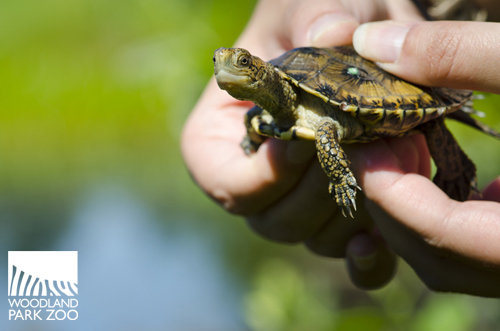 Reduce pollutants to native turtle habitat by eliminating chemical pesticides from your gardening practices. Pesticides get into water, which runs away from your garden and flows into surrounding water systems, bringing contaminants into wildlife habitat. 3. 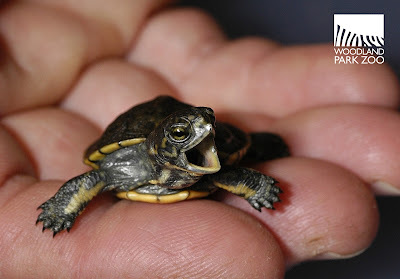 Use a reputable source when purchasing or adopting pet turtles and make sure the species is legal to own and the animals have been sourced legally. Only captive-bred turtles should be obtained as pets. 5. Support Woodland Park Zoo and other organizations working to conserve endangered turtles. Tell your friends about turtle conservation and ways they can help, share this story on your favorite social network, take a trip to the zoo with friends and family to learn more, make a donation to the zoo’s conservation program…there are many ways to show your support and help us make a difference for turtles! Good luck out there, #2! Photo by Ryan Hawk/Woodland Park Zoo. Little turtle "2" is off on its own now, but thanks to you, it’s got a whole community behind it. Yay for #2 and to all the rest of the little guys released! Go free! Thank you to Woodland Park Zoo for sharing their amazing trek. 2 weeks ago, 10 of us in the neighborhood of Waterford Park in Mukilteo witnessed a turtle (with about an 8 in shell)dig a hole, lay 10 eggs, and covered the hole. The location is between a street and a pond. A neighbor covered the site with chicken wire to hopefully prevent raccoons and others from digging them up. When do you think they will hatch?? Anonymous - If this was a native turtle, the incubation period will probably be somewhere between 80 and 100 days. Do you think the zoo should raise the youngin's or should nature take its course? Few western pond turtles remain in the state outside of the protected areas, but if you believe you have spotted these native turtles, it would be helpful if you could email some essential details to zooinfo@zoo.org so we can make sure this data is tracked. We need basic info like where you saw the turtle/nest (be as detailed as you can be and include an address, GPS coordinates, or nearby landmark if you can), when you saw it (date and time), a description of the turtle (any colors, markings, patterns, size, etc. ), what you saw the turtle doing (any info about the nesting, in your case), and send pictures if you were able to take any (of the nesting site and/or the turtle itself). Thanks! Great! I think leaving the animals free in there own place makes them live longer and much happier. What’s small and white and cute all over?